In time for National Upcycling Day, Gumtree is on a mission to spread the word about upcycling and encourage the nation to cut back on waste. In celebration of the second annual National Upcycling Day which takes place this Friday (24th June), Gumtree is encouraging households across the country to consider upcycling items otherwise destined for a landfill. Whilst the sales of upcycled items on the UK’s largest classifieds website have increased by 50 percent in the past year, a survey commissioned by Gumtree reveals that Brits still throw out a huge amount of household items that could be upcycled. The findings reveal that sofas top the list of furniture most likely to be thrown out – a shocking one in eight households have thrown out up to two sofas in the last year, amounting to over a quarter of a million sofas going to landfill every month. This is just one example of the vast amount of household items that go to waste: over 190,000 dining tables, 150,000 coffee tables, 290,000 suitcases and 135,000 dining chairs also get the boot every month. This is a huge amount of waste considering you can sell a dining table and four chairs on Gumtree for on average, £150. The desire to give a new lease of life to old materials by turning them into something functional and beautiful is on the rise across Britain – 40 per cent of Brits say they have tried their hand at upcycling and a further 1 in 5 upcycle on a regular basis. However, 40 per cent who don’t upcycle say the biggest obstacle to upcycling is not feeling creative enough, whilst a third don’t know what to upcycle. To combat this hurdle and encourage the nation to give old household items another chance, Gumtree is taking upcycling on the road for this year’s National Upcycling Day. The company has partnered with upcycling expert Max McMurdo to transform an old double-decker bus into an upcycling workshop. The bus will be travelling across the UK inviting the public on board to create something amazing and inspire the nation to think twice before throwing things out. “I was pretty shocked to hear how many pieces of old furniture get thrown out every year – these are an upcycler’s dream – there are so many amazing and simple things you can create from something like an old coffee table. “The Upcycle Revolution was a successful campaign last year and we’re excited to be taking it on the road this year with our upcycling bus tour. We want to be able to encourage the nation to waste less and inspire them to try their hand at upcycling in order to do so. 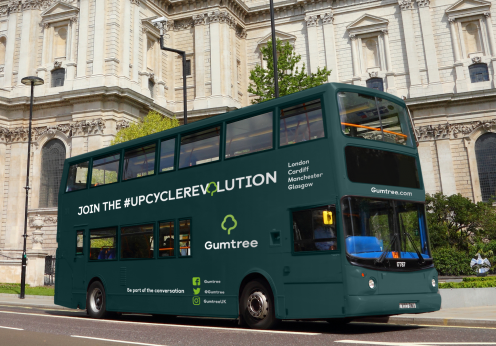 To find out more about the Upcycling bus tour or National Upcycling Day follow the hashtag #UpcycleRevolution on Twitter and Facebook and find out more on the Gumtree Upcyling hub.